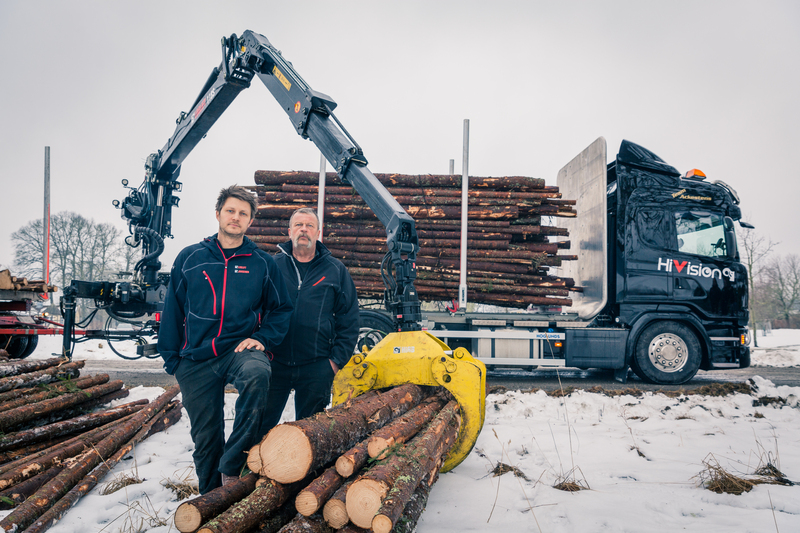 Hiab, part of Cargotec, has delivered to its customer in Sweden the first LOGLIFT forestry crane equipped with the camera-based HiVisionTM control system. HiVision moves crane operation to the truck cabin. It has four cameras on top of the forestry crane that provide the operator with a realistic 270-degree view. This enables the crane operator to see the working area and operate the crane from the truck cabin using virtual reality goggles. Hiab's long-standing customer Ackestens Åkeri AB chose a LOGLIFT forestry crane with HiVision on their new Scania truck. "We have always been eager to try new things in our business," says Mr. Johan Ackesten, the owner and founder of the company. "We were one of the first companies in this business in our area to buy a cabin-equipped forestry crane in the 1990s. When we saw and tested HiVision last year, it was quite obvious for us to go for this innovative solution. Also, my sons working with me in the company were very eager to acquire the next generation forestry crane", Mr. Ackesten explains. The criteria for Ackestens Åkeri buying LOGLIFT forestry crane with HiVision were safety, ergonomics and better economy. "Climbing into the cabin especially in harsh weather conditions can be dangerous. There is no need to do that anymore. Also, our customers in the forest industry appreciate that we can load more timber when we save on the weight of the cabin", Mr. Ackesten says. "We are very happy that customers have shown an interest and trust in the HiVision control system. We will continue the close cooperation also in the future in order to gain the customer's insight for further development", says Martin Klyver, Sales and Product Business Manager, Hiab. During the spring Hiab will continue HiVision deliveries in Europe and Japan.